Once the news broke of veteran WABC reporter Lisa Colagrossi's death early Saturday morning, Twitter and Facebook exploded with love and sympathy for Lisa's family, friends, and colleagues. The tributes have continued since then, and are still being posted. Here are some of the most touching posts. Over the past two days, between the two of us, we have tried to re-post most of the tweets and Facebook posts, so check out@NYNewsObserver and @NYNewser on Twitter for a more complete list of tribute postings. View more tweets after the break- click below to extend the post. A devastating loss was cast upon the tri-state area this weekend. Just after midnight Saturday, WABC-TV confirmed that veteran Eyewitness News reporter Lisa Colagrossi passed away after suffering a brain hemorrhage Thursday morning. Returning from a fire scene in Woodhaven, Queens, Lisa collapsed in the live truck. Her cameraman flagged down a passing ambulance and she was rushed to New York Presbyterian Hospital. Even with the swift actions of her colleague and first responders, Lisa never regained consciousness. With her family by her side Friday morning, she was taken off of life support. Lisa’s passing has not only affected the Eyewitness News family, it has affected everyone who knew her and watched her, including New York anchors and reporters who have worked alongside her for years. An outpouring of support from each station is well noted on-air and on Twitter. These were just four out of thousands of tweets posted in memory of Lisa. To the average viewer Lisa was just a reporter, but if you were watching closely, like many viewers did, you saw that Lisa was a friend and she was with us through all the good and the bad. Having joined WABC five days after the catastrophic events of September 11, 2001, she covered it all. From the crash of American Airlines Flight 587 in Belle Harbor, Queens, to the tragedy at Sandy Hook Elementary School, to Hurricane Sandy and every other event in between, Lisa has been with New Yorkers through it all. And she was with New Yorkers on the morning of Thursday, March 19th at the scene of breaking news in Queens. It is hard to fathom that it was the last place we’d see her report from. On a personal note, Lisa was kind, a professional at what she did and what can only be describes as the best of the best. She was someone who frequently interacted with her viewers online and always took the time let us into her life. Today, as we somberly remember Lisa, take a moment to thank the Colagrossi family for letting Lisa into our lives. Our sincerest condolences to her husband, her sons, her entire family and her colleagues at Channel 7. After 14 years, Lisa felt like a member of our families just as much as she was a part of the WABC family. It’s hard to comprehend that we heard, “Reporting live, Lisa Colagrossi, Channel 7 Eyewitness News” for the final time on Thursday morning. Lori Stokes said it best- “It’s hard to imagine mornings without you.” A staple in New York whom we shall never forget. The legacy left behind by Lisa Colagrossi will carry on for years to come. Yes, mornings will go on, but not as they used to. Personally, we hope Lisa knew just how much she meant to the people of this city, and that we will never forget the memories she leaves behind. We send send our thoughts and prayers to the WABC family and to the Colagrossi family. Heaven has certainly gained another angel. Rest in peace, Lisa Colagrossi. THIS JUST IN: WABC-TV/Channel 7 remains the news leader in New York and the United States from sign-on to sign-off. Beginning with "Eyewitness News This Morning" and "Eyewitness News at Noon" with Lori Stokes and Ken Rosato, Channel 7 hits the ground running, taking the top spots in all competitive timeslots. "Eyewitness News First at Four" has shown continued growth since its launch in 2011. "Eyewitness News at Five" and "Eyewitness News at Six" clinch their timeslots easily over competitors WCBS, WNBC, WNYW; and WPIX at 5pm. Finally, "Eyewitness News at Eleven," was the highest rated newscast in the nation, besting all New York competitors, as well as every other station in the nation. 7online remained the top local news website as well, drawing over 40 million unique views across all platforms. Full analysis coming later tonight. NYCTV AWARDS: The Final Round is Here! First reported by TVSpy, WLNY-TV 10/55 will launch a 9pm weekend newscast on Saturday, July 12. The newscast will replace Law and Order: Special Victims Unit, which airs reruns on WLNY at 9pm on the weekends. 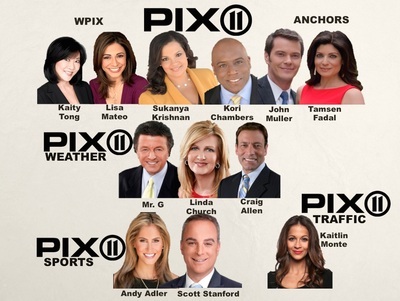 The newscast will be anchored by Cindy Hsu, who anchors the weekend 11pm newscasts on sister station WCBS-TV. Hsu will be joined by her WCBS colleagues Meteorologist Elise Finch with weather and Steve Overmeyer with sports. David Friend, SVP of News for CBS Television Stations and News Director for WCBS-TV, said in a statement to TVSpy that "WLNY’s 9 p.m. newscast addresses viewers’ needs to have their local news at an earlier time in the evening and the newly expanded broadcast will now allow audiences to do that on the weekend as well." 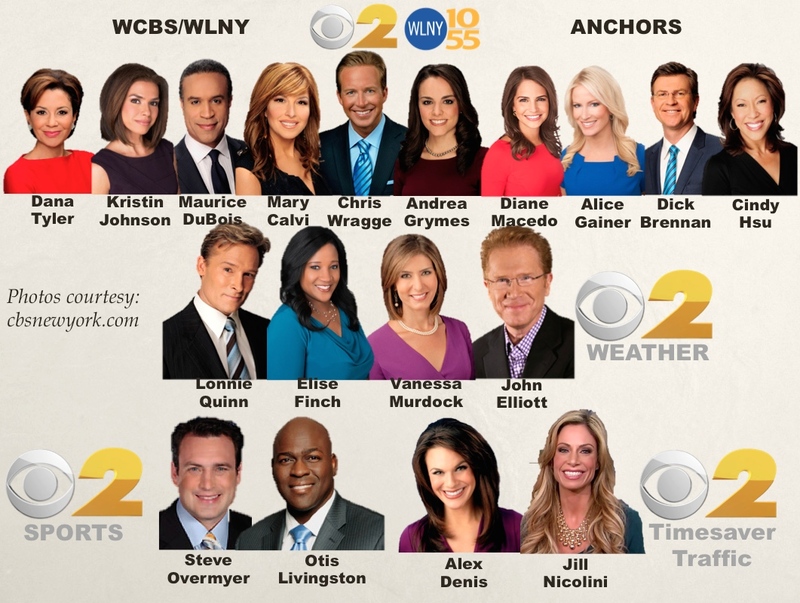 CBS completed its purchase of WLNY in early 2012, and the addition of the weekend newscasts comes about two years after CBS Television launched the weekday "News at 9" on WLNY on July 2, 2012. Viewers and fans of WCBS’s morning newcast CBS2 News This Morning may have noticed a switch up Monday as Alex Denis returned to the show after several months off for maternity leave. Since joining the team in January 2012, Alex has been covering traffic every weekday morning from 4:30-7AM. Since her maternity leave began back in February, Jill Nicolini has been filling in for her on weekday mornings. Nicolini just recently joined the morning team over at CBS2’s sister station WLNY TV10/55 to cover traffic for their morning show Live From The Couch. 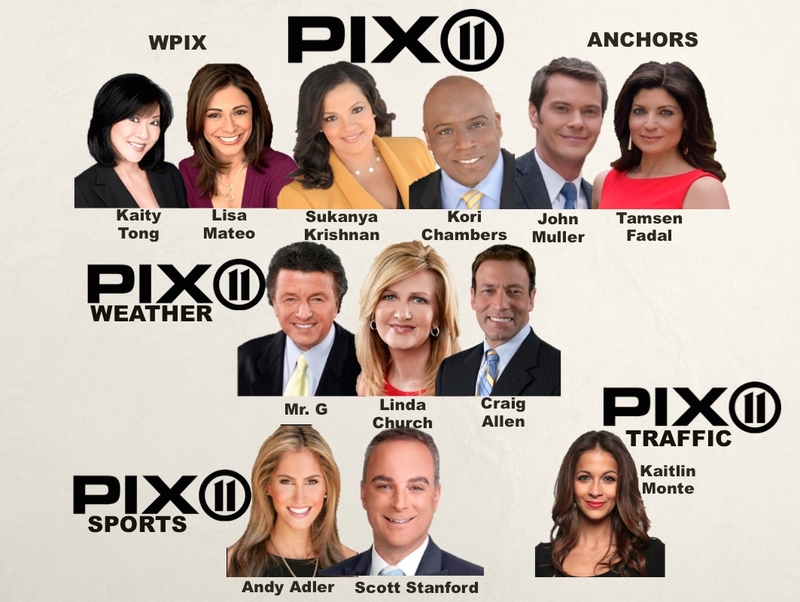 We’ve just recently learned that from now on, Nicolini will continue to cover traffic on both CBS2 from 4:30-7AM and on WLNY 10/55 from 7-9AM. This is no surprise since Jill has a history with New York’s morning commute after covering traffic for several years over at WPIX. What began on Monday for Denis is a new segment called "Now Trending with Alex Denis”. Basically, every morning during the shows 5 & 6AM hours, Alex will join Chris Wragge & Mary Calvi at the anchor desk to discuss what’s trending with entertainment news and on social media. Denis is quoted on-air saying that, “instead of following traffic on the roads, I’ll now be following all the latest social media traffic.” Her segments will include reading posts and tweets from viewers on the air and following all the latest hashtags trending. These new segments won’t just keep her in Studio 46, several days she’ll be out in the community checking out the best places to eat and whatever else she decides to cover. She’s encouraging viewers to get involved in the conversation via Twitter and to also tweet her with story ideas. Her twitter handle is @AlexDenisTV. Sources confirm to @NYNewser and @Ny_NewsObserver that well-known Eyewitness News chopper reporter Dan Rice was let go from WABC a few weeks ago. Rice has been a reporter from the station's helicopter, NewsCopter7, since joining the WABC team in 2009, after a decade at rival WNBC in Chopper4 and two years at WCBS in Chopper2. While at WABC, Rice could be seen daily on the noon newscast and as a fill-in morning and evening reporter. During his run at WABC, Rice covered many breaking news stories for New York's number one station, from the daily traffic jam to airplane crashes. Rice was unavailable for comment late Wednesday evening. 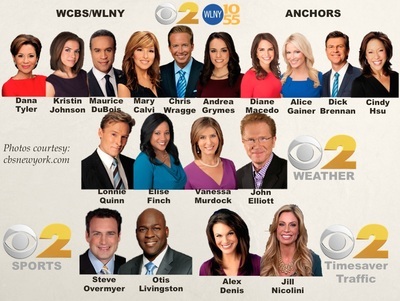 The Nielsen February 2014 sweeps results are in, and for New York TV news, the results are not surprising First reported earlier, WABC-TV, Channel 7 Eyewitness News, takes the top spot in both the New York market, DMA 1, as well as the country as a whole. In the morning, Eyewitness News This Morning with Lori Stokes and Ken Rosato is number one from 4:30-5am in DMA households and the key 25-54 demo. The 5am hour of Eyewitness News wins by a sky-high 83% margin in total viewers, and also beats its competitors in the key demo. At 6am, WABC is the leader again, with double the viewers as its closest competitor. The 6am WABC broadcast is up 62% total DMA households and up 60% in the 25-54 demo. For the network timeslot of 7-9am, "Good Morning America" on WABC holds a 31% advantage in New York DMA households and a 13% advantage in the 25-54 demo over its closest competitor. This was especially significant for this February, as "Good Morning America" faced tough competition from WNBC's "Today," which was expected to see a massive boost from the Olympics, which were exclusively on NBC. For 12 Noon news, WABC remains the leader. Eyewitness News at Noon, with Lori Stokes and Ken Rosato, has a 83% lead over its closest competitor. In the 25-54 demo, the noon newscast has more viewers than all of its competitors combined for that demo. 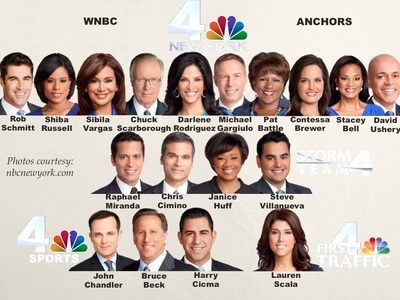 Eyewitness News First at 4pm, the only New York City news on at 4, is the only timeslot that WABC doesn't lead. That said, First at 4, anchored by Liz Cho and David Novarro, has apparently grown significantly over the past year and has comparable ratings to 5 & 6pm broadcasts. Judge Judy on WCBS attracted more viewers than the program. 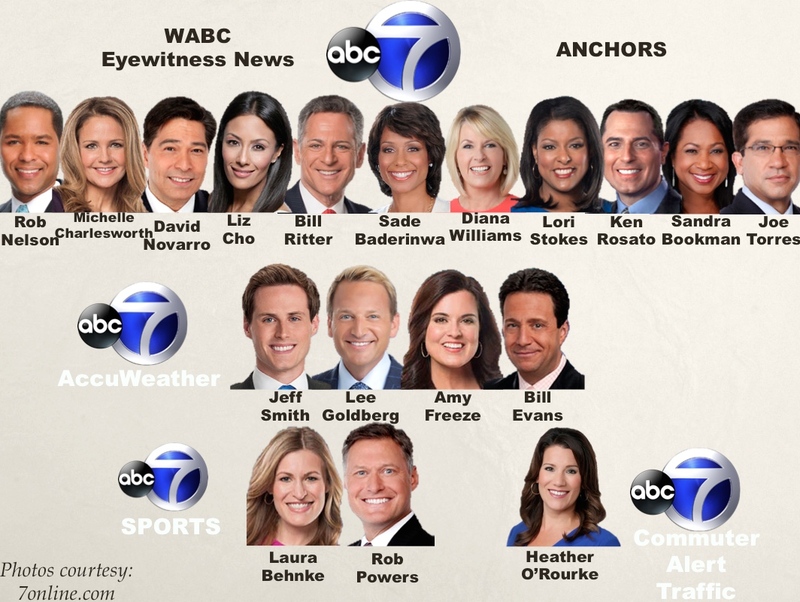 However, Eyewitness News did pull ahead of the Olympics coverage during the 4pm hour. At 5pm, when all of the New York stations air a newscast, WABC is still number one. With a 29% lead in DMA households and a 50% lead in the 25-54 demo over competitors, WABC is the clearly the winner with Eyewitnews News at 5, anchored by Diana Williams and Sade Baderinwa. At 6pm, WABC comes out on top once again. With a 41% lead in DMA households over its closest competitor and an extremely large 67% lead in the 25-54 demo, Eyewitness News at 6, anchored by Bill Ritter and Liz Cho, has spent the last 120 sweeps in first place. 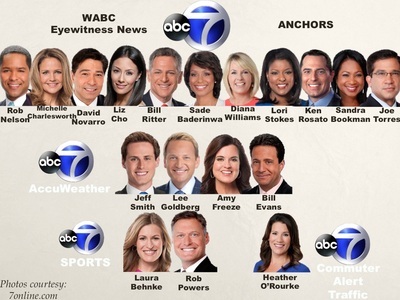 At 11pm, Eyewitness News at 11 with Bill Ritter and Sade Baderinwa continues to dominate the competition, taking first place in newscasts aired at 11pm, but WABC had a lower rating than WNBC, which aired Olympics until 11:30pm. In terms of afternoon and evening news from the ABC Network, ABC World News with Diane Sawyer leads its closest competitor by a 44% margin in total viewers, and 12% in the key demo. Nightline is also enjoying increasing ratings in its timeslot, and battles for first place with new program on NBC "Late Night with Seth Myers," which has seen relatively low ratings compared to its predecessor, "Late Night with Jimmy Fallon." For the weekends, WABC continues the winning streak. Eyewitness News This Morning (Weekend) with Rob Nelson and Michelle Charlesworth holds the number one spot on both DMA households and the key 25-54 demo. Eyewitness News at 11 (weekend), anchored by Joe Torres and Sandra Bookman, also stayed competitive, while battling the Olympics on NBC. In terms of WABC's web ventures, the station's news mobile apps, including the main news app, the alarm clock app, and the "AccuTrack" weather app, have drawn a combined 39 million views in February. 7online also continues to be successful, with over 15 million views per month and a increasing numbers of unique visitors. This sweeps resulted in an overall dominance of the market for WABC-TV, which remained competitive in every timeslot, compared to the November 2013 sweeps. 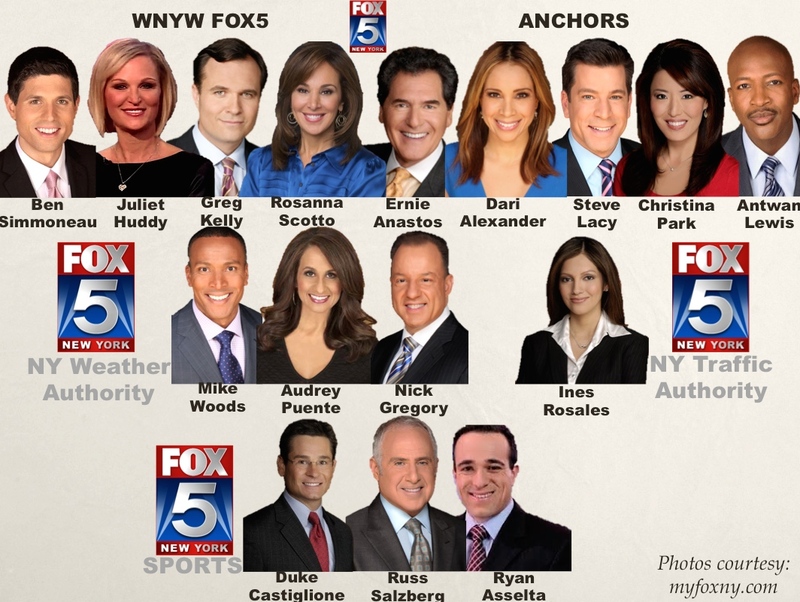 FIRST from NYNewser and Ny_NewsObserver: Television sweeps for February 2014 ended earlier this week, and it was as competitive as ever in New York for TV News, with the ever-changing weather conditions and the Olympics. As a preliminary overview, WABC-TV remains the ratings leader overall in the New York City market, DMA 1. Across multiple weekday and weekend newscasts, Channel 7 shows continued strength, even when faced with the Olympics on WNBC and the fierce weather conditions of February. We&apos;ll have a full breakdown of sweeps later today in a full article. Stay tuned!